A UConn student uses the time of preaching the Gospel to proclaim his opposition to what God has declared as holy and undefiled. Our Salem 2015 preaching tour started at the Philadelphia outfest gay-pride festival. From Pa, I traveled with my friend John Beeton to preach at some more local colleges, James Madison, George Mason, and George Washington University. we also spent a Saturday preaching outside the Whitehouse. My good friend Bobby Mcreery arrived in Philadelphia on Wednesday, and so we preached in and around Pa. redeeming the time, preaching the gospel and praying that God would save souls. We preached at Lockhaven University, Bloomsburg University, and at Princeton University outside the Tiger Inn mealhouse (after hours). Sadly at the tiger Inn, a macho-types bouncer kicked my amplifier and broke it, but when the police were called by some Princeton students, his bravado disappeared, he denied his what he had been so proud of earlier, and he blamed a Princeton student for breaking the amp. No fear of God for him, but the fear of police cowered him. But God knows, and he knows what the truth is. We also spent a day preaching in downtown Newark N.J. at the corner of Broad and Market St. This is my favorite place to preach. There are no rich men here, only broken, poor, distressed men and women, many enslaved to sin, addicted to drugs or alcohol, drug dealers, Black Hebrew Israelites, Nation of Islam, Black Muslims, and so many lost, like sheep without a shepherd. We were humbled and privileged to tell them about The Good Shepherd, who laid down His life for His sheep, and then overcame death, so that they might be set free and overcome sin. Leaving NJ Sunday night we traveled to Connecticut, so that we could preach at UConn Monday. John Beeton drove up to preach with us and he would remain until after Salem. Monday night we drove to Danvers Massachusetts, where our host, pastor Stephen Brock had arranged for us to stay the week. An interesting situation developed while staying in Danvers. Salem has marketed and profited from the witch trials and the execution of 19 men and women. History reveals that this is all marketing propaganda, for the witch trials and executions took place in a nearby town called Salem City in the 17th century. Salem City has been renamed – Danvers. And where we resided in Danvers is adjacent to a granite memorial to the 19 men and women who were determined to be guilty of witchcraft and executed, painfully. At the Danvers memorial there was no party, no reveling, no capitalistic endeavors, just a granite memorial.
. While staying in Danvers, we preached at UMass Boston, UMass Lowell, and Boston Commons. UMass Boston usually has a large turnout of students wanting to voice their opinions. Earlier this semester we preached there and the crowd was big, and loud. This time there was a concerted effort to ignore the preaching, and one student while distributing rainbow stickers, did his best to usher the other students away from our location. There were still some who sat and listened, some took Gospel literature, and there were many one to one conversations. Pastor Brock preached for the first time at a college. He preached with authority, shared his testimony with tears, and made a passionate appeal that the students be reconciled to God. Later in the day a crowd developed and a few young women proudly defended planned parenthood, even claiming the recent videos seen nationwide were untrue. When the topic being preached moved to abortion, another young woman wept and sobbed. She heard that day how sins are forgiven and what the high cost of sin is; even the blood of God’s precious Son. She heard there was grace freely given to those who own their sin and take their sins to Jesus Christ, laying them upon Him, in repentance and faith. While she sobbed and was defended and comforted by her peers, I looked across the plaza and saw another young woman in a conversation with Pastor Brock. She also was weeping. He later said she was deeply convicted of sin and asking for forgiveness. He ministered to her and she made a profession of faith. We later prayed for her, that her’s was a Godly sorrow for her sin that would lead to repentance, and not just the worldly sorrow leading to death. At UMass Lowell, a crowd gathered quickly, but as time passed a young man was able to lead all of the students away, reminiscent of the pied piper. Before long many students returned, and it appeared that a class had been sent out to take notes. John answered questions from about 20 students, who with their notepads and pens were asking questions, even raising their hand to get his attention. This is a very rare and infrequent occurrence at universities, and we have no way of knowing the motives involved, but the truth was shared in love. As the afternoon wore on, the weather got rainy and some young men showed up to drown out the preaching with a snare drum, a trumpet, and a saxophone. They also brought out a large Communist Russia flag with hammer and sickle and paraded it around the center of campus. We left them playing in the rain. Thursday we went with the Pastor, his son and some visiting Christian men to Boston Commons. While near the courthouse we encountered a protest rally, with approximately 50 men and women protesting the shooting of deer in their neighborhood, and recommending birth control for deer vice shot guns. We upbraided the crowd for being concerned for the killing of deer yet silent on the issue of abortion and the killing of 4,000 unborn babies daily. It was also ironic that they protested the right of a citizen to choose to hunt deer, yet would champion the choice of a mom, to destroy her son or daughter. While Bobby was preaching, he was attacked by a young deer-saver. Bobby’s glasses were knocked into the street, and by God’s grace this happened just as the stoplight changed, and the glasses were recovered without damage. The young man who made the attack was rebuked by his fellow deer-savers, and his protest signs were taken away. The leaders of the protest were upset, and asked us to go elsewhere. They were relieved when I said we would finish then leave, and the woman in charge thanked me when I kept my word and left after 5 minutes more of preaching. Later that day Bobby had an extended conversation with the male leader of the protest. He was a middle aged Caucasian with a small pony tail, who had a Buddhist-like world view. After some conversation he acknowledged his thoughts on the sanctity of life was inconsistent in that he championed the cause for all sorts of life except unborn babies. We hope he will ponder this in his heart, although we know that until he understands the sin issue, and comes to seek the living God, it remains abstract philosophy. We finished the day preaching in Boston, and returned to Danvers, where Mike Stockwell was waiting for us. Friday and Saturday were set apart for preaching in Salem. The weather was perfect and the crowd were estimated to be the biggest ever. The crowd response to preaching in Salem during Halloween season is that similar to the crowd response when the first Christian Martyr, Stephen, finished his sermon. The party area in Salem is huge, and you would think that there is ample room for those that deny God or hate God, to pass by, eat, drink, and be merry, knowing that tomorrow they might die. But an irrational hatred comes upon many, so that they are drawn to and can’t leave the preaching. We do not set up near the center of festivities, but find a spot somewhere that we can be heard. Thousands heard the Gospel in those two days. 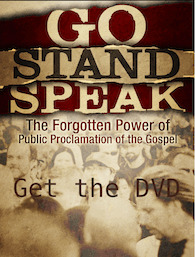 In addition to the professing atheists, many gather espousing a message contrary to all that is revealed in the Bible. Unconditional love, license to sin, discounting the truth of the Bible is their message and most of these make claims of loving God or identify themselves as Christians. They would deny truth, judgment, and hell and judge anyone who differed with their message as judgmental and narrow-minded. They redefine tolerance, to mean acceptance, and even approving or applauding any type of behavior. In reality they demonstrate their intolerance, for all Christians who hold to Biblical truths, although the Bible commands all Christians to love neighbors and enemies. Christians may disagree, yet in love we tolerate, our weapons are not carnal in nature but spiritual. It is the Gospel which is the power of God unto salvation for those who believe. It is a bizarre sight to see men preaching from the Bible and many railing and ranting their disapproval, often while they are wearing strange costumes, making lewd and obscene gestures, the pagans and wicca also trying to demonstrate some power over men filled with the Spirit of God. A professing witch was disgusted with my ignorance of her talent psychometry. . Had we exchanged a handshake, she would have left the question unasked. Repentance and remission for sins was preached, Jesus Christ crucified and resurrected was boldly proclaimed, and all men were called to repent and believe on the Lord Jesus Christ. I believe if the behavior of those partying was objectively reviewed, it would be seen as abject depravity, on a public street, in a mixed crowd including children. But except by the grace of God, I may have been amongst them. Oh now let us pray that God would open their eyes that they may turn from the darkness to light and from the power of satan to God, that they may receive forgiveness of sins and a share among those who are sanctified by faith in Jesus Christ. Sunday we worshipped with the brethren atPastor Brock’s church, True Gospel Baptist Church, and by Sunday night we were back in NJ, so that Bobby could fly home from Philadelphia the next day. I thank God for all He provided on this mission. I thank God for all the saints who love Jesus, and desire that His name would be made great, even in a culture such as ours. I thank God that He would use earthen vessels to bring the message of salvation to those who may despise it. I thank God that He alone can save a soul, and He sends us to preach, but salvation is of the Lord, and He gives His glory to none other. I thank God that salvation is offered freely and that there is no partiality with God. All thanks to God, for I obtained help that comes from God, so that I can stand and testify to both small and great, saying nothing else than what the prophets and Moses said would take place– that the Messiah must suffer and that as the first to rise from the dead, He would proclaim light to the Jews and the Gentiles. Newark NJ. Broad and Market ST.